With a nod to fashion and fascination for armor I design dress ensembles that merge classical armor and drapery to convey a feminine resistance. 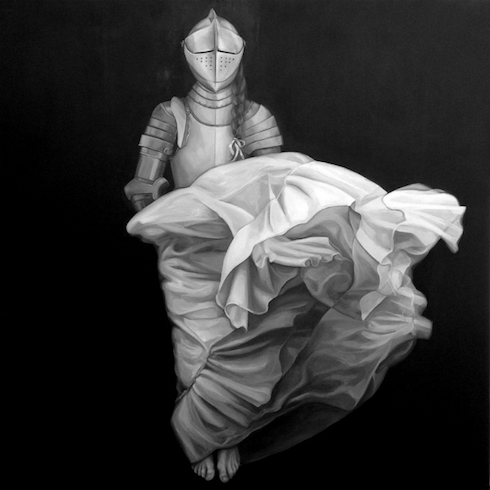 I’m interested in how an armor dress can translate into a metaphor of how women protect their bodies/selves in the world. Blending fabric and metal together create a juxtaposition between contrasting elements of fragility and strength inherent in nature, individuals, and society. My work includes oil paintings, metal sculpture, and metal reliefs. While I use a variety of materials and processes, they are linked by a shared exploration of armor and its ability to protect.